I have been having issues when gluing up radius jambs. They seem to cup on me. I am not talking about springing, cupping. I make a form then lay up 1/8" to 1/4" skins and clamp them to the form. After the glue dries and I remove them from the form they have a cup to them. Can anyone give me some insight on this. Width of jamb? Glue type? How many laminations? Radius? David, Jamb width varies, but most are around 6 to 9" wide. Glue is loctite UR 5153 Polyurethane. The lay up was (2) 1/4" (1) 3/8" wiggle and (2) 1/8" in that order with the 1/4" oieces being the inside face of the jambs. Radius on the last piece was 240"
Are you using male AND female forms? We only use the male form and wrap the skins around it and clamp them with a non glued skin and blocks over that. Im not a fan of that Peter. I always make both. If you dont have a CNC machine i know its alot more work but so is remaking the jambs. I used to use truck straps before i hit myself in the head enough times. Some of these jamb units are 8-10' long so making a male and female form gets crazy. I do have a cnc machine. If using both eleminates the cupping I will do that. Thanks for the input. Do you apply glue to both surfaces on each joint or only one side? If you only apply to one side perhaps those sides in each layer get a chance to take on more moister prior to clamping. As a result each layer dries more on one side and the whole jamb cubs? Both sides are glued evenly. We roll the glue on oneside lay it on the form, then roll the glue on the face side. When placing the next skin on we roll glue that as well and lay it on the glued face side of previous skin. More Info Request: How much cup? 1/16" or 1/2" Across the entire width and length, or just in spots? Is Loctite a solvent based glue - no water? The glue is not the likely source of moisture as it is PU. I would use a moisture meter on the skin stock. If you are resawing for the skins then it is likely that the core of the stock is wetter and is cupping when exposed to the atmosphere. The cure, check the moisture of the stock. Resaw and let skins acclimate before use. Thanks, I will try that as we do resaw then sand them and lay them up. I will let them sit for a day or so and then glue up. I may have misunderstood your layout of the lamination layers. Then @ layer of 3/8 bendable ply and 2 @ 1/8 on outside of jamb? If this was the sequence the different layers inside versus outside potentially create the cop? We thought that as well. We will not be doing that in the future. Thanks for all your input. We will be taking all the information we have from here and putting it to use. I think your unbalanced construction might be the source of the problem. Separately, I put curved jamb laminations in a narrow vacuum bag I made and clamp it into a female mold. I put a 1/16" flat steel band ( same width as jamb) over the male mould first. Then all the laminations followed by 1/16" steel band last. I would get rid of the wiggle wood and stick to solid wood laminations. I also would use Resorcinol or Plastic Resin Glue as it cures COMPLETELY RIGID. Male and female moulds are the only way to go. EASY to clamp as well. My first guess would be uneven clamping pressure. I suspect you are bending your cauls. You get more clamping pressure on the edges of the laminate. I did many many curved/radius jambs for my first boss. We always seem to get all of the radius topped doors and windows. Our method was farm tech. 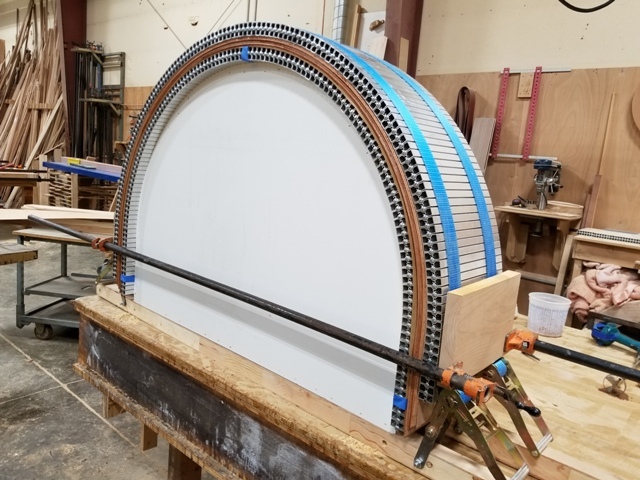 3/4" plywood sides in the shape of the inner curve. poplar sticks screwed from one side to the other. first layer was something flexi & smooth like masonite. Then poly sheeting. Throw the layers on glueing them with epoxy. Stiff poplar cauls on top of the laminate. Nothing to smooth out the clamping force. We had 5/16" carriage bolts as clamps in each caul. Other than caul marks on the outer veneer these jamb sets were perfect. What are your cauls and clamping force? I've never seen a laminated jamb cup. Excessive spring back and delamination are common. Cauls are either sapele or poplar. We use I-beam clamps. The form templates are made on the CNC with offset openings for the clamps to fit in. These jambs are for garage door openings, so they are typically large in length. (When we door man door jambs we haven't had any issues.) We have had success and we have had cupping. Usually the cupping is about 1/8 to 3/16". I am just trying to figure out the best method so we can be consistent. The feedback we are getting here is great and I hope to put it all together to come up with a successful plan of action. Thank you for your input. Perhaps I missed it but you don't seem to have specified which way these are cupping. Are the edge curling up towards the face of the jambs or rearward towards the back of the jamb. I.e. is the face of the jamb concave or convex across the width. The most uniform pressure possible is with a vacuum bag, and you only need one form. You don't even need a complete form, just enough points along your arch to define the shape. See attached photos. Your fabrication methods are excellent. Glue really has little impact. We use epoxy 95% of the time, because of the working time, we have buckets of it, and it’s waterproof. Titebond1 works fine if you are fast. Needs two guys. The problem is your laminate schedule. It should be balanced. We use 1/4” veneers of the same wood sanded to 80grit on the thickness sander. I’d guess the bending ply is 100% of the problem. 1/2” wood, 3/8 bending ply, 1/4” wood is as unbalanced as a laminate can get. You are also wasting time & material for zero gain. We’ve done 2 car garage doors 12” wide layups with zero cupping. That was with the farm tech method. We have used a similar method as yours for the last 15 years. 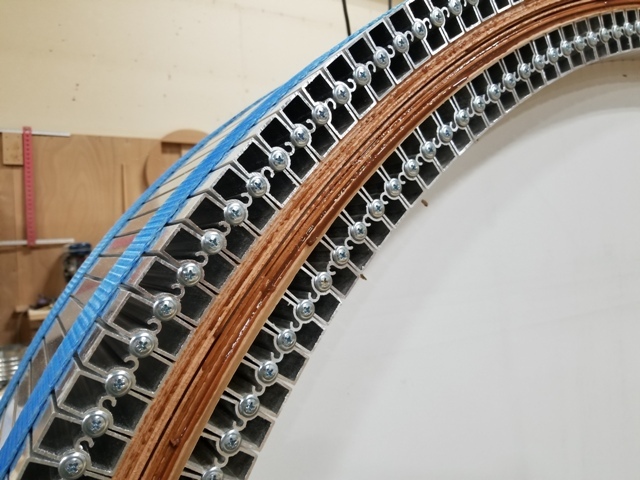 BH Davis specialises in curved/radius work. I would take his opinion over anyone else’s including mine. john, can you talk a little about that bag setup - is that a disposable, one-time use bag, or one you use repeatedly? can you point me to the material/vendor (assuming it's a one-time use)? Dave, I made the bag from 30 mil vinyl that I bought at a local shop that makes custom boat windows, covers, etc. McMaster Carr sells it, too. Vinyl is PVC and can be glued with regular PVC pipe cement, or a special PVC glue you can buy from Joe Woodworker. You also can buy bag penetrations from him, as well as seamless vinyl and polyurethane bag material. You don't need any special closure system although you can buy them. I just roll the open end of the bag around a piece of wood and clamp another over the top. The vinyl sticks to itself well enough that it forms a very good seal. Polyurethane is more pliable than vinyl and more durable, but I'm cheap and a low volume guy so I use vinyl. I'm still using the first bag I made over 20 years ago and it has been used probably 100 times, with just a couple of leaks that were easily patched. No matter how you go about it, a vacuum bag is the easiest and best way to get uniform pressure on anything curved, or flat for that matter. I've done a lot of curved work, including some pretty large panels, and only having to build one mold greatly simplifies the process. With curved head jambs you put the laminations in the bag, pull a slight vacuum, then clamp it against the mold with cauls on the non-mold side, then pull the final vacuum. I use thin plies, rarely more than 3/16", or bending plywood sometimes, and plastic resin glue or epoxy to eliminate spring back. Liking our curve-o-matic. Been doing this a long long time and have tried every method mentioned here. Vacuum bag for us is to cumbersome and not accurate enough for door work especially large full round. Male female is ok but the stars have to align perfectly to get even clamping pressure. Prior to the curve-o-matic a male with thin layers of solid wood and multiple caul layers, strap clamps, was the best. Our rule of thumb is if it doesn't lay over the form easily the lams are too thick!